Often considered to offer the best value among Medicare Supplement plans, Supplement Plan G provides significant coverage. It’s the second most popular Medigap plan behind Medicare Supplement Plan F.
The following are a few reasons why Plan G deserves your attention if you’re nearing age 65. Although many people have heard about Plan F, Plan G often gets overlooked. The only difference between Plans F and G is that the latter doesn’t cover the Medicare Part B deductible. All other types of coverage remain the same. Supplement Plan G covers 80 percent of foreign travel emergency expenses and 100 percent of Part B excess charges, your Part A deductible, and skilled nursing facility coinsurance expenses, among other charges. You won’t have to pay much out-of-pocket for your healthcare expenses. After the small deductible associated with Medicare Part B, beneficiaries can rest assured that they won’t receive unexpected medical bills related to physician or hospital care. In 2018, the Part A deductible, which applies to hospital stays, is $1,340. With Medicare Supplement Plan G, you won’t have to come up with that money if you’re forced to spend time in the hospital after an injury or illness. By contrast, Medicare Supplement Plans K and M only cover 50 percent, while Plan L covers 75 percent of your Part A deductible. Some seniors choose Medicare Supplement Plan F because it takes care of your Medicare Part B deductible. However, in 2018, the Part B deductible is just $183. If you’re able to save more than that on your premiums over Part F, you’ll find yourself ahead financially if you go with Part G.
Your deductible applies to an entire calendar year, while your monthly premiums are due every month. This is why comparison shopping has become so important. Running the numbers to determine your Medicare-related expenses can help you make a more educated choice. 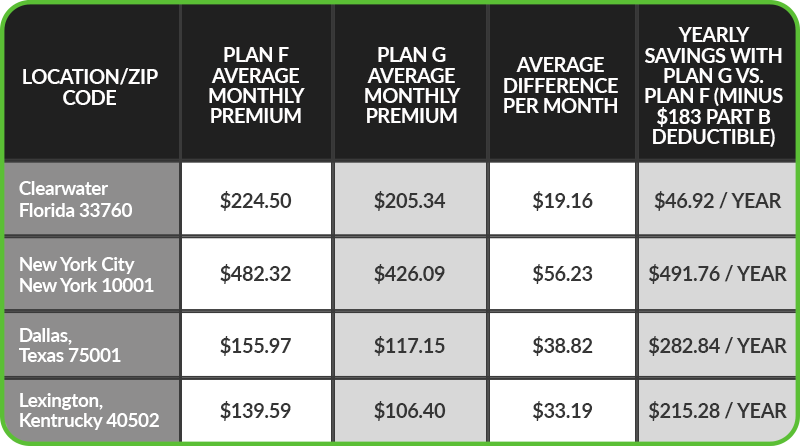 For instance, you could compare Supplement Plan G against Plan F.
In this chart, we can see that in all four zip codes, Plan G represents a savings of far more than the Part B deductible. In New York City, New York, beneficiaries can save nearly $500 per year by choosing Plan G over Plan F.
Your savings can add up even further if you don’t meet your deductible every year. Extremely healthy beneficiaries might not need to visit their physicians often, but you’ll know that you can go to the doctor when you need to. Even if you are in excellent overall health, you might need to see a doctor regularly to maintain that good health. For instance, patients with Type 1 diabetes might have to visit their endocrinologists weekly or monthly to make sure they’re getting the proper treatment. Choosing a comprehensive plan like Medicare Supplement Plan G can make those visits far less expensive. Once you meet the $183 deductible, as of 2018, you won’t have to pay anything else out-of-pocket. If you’re interested in planning for retirement and ensuring your continued healthcare coverage, shop for Medicare Supplement plans to determine which will work best for you. Supplement Plan G might offer the ideal combination of coverages.